Adèle Haenel (born 1 January 1989) is a French actress. She has been nominated twice for the César Award for Most Promising Actress; in 2008 for her performance in Water Lilies (2007), and in 2012 for House of Tolerance (2011). In 2014, Haenel was awarded the César Award for Best Supporting Actress for her role in Suzanne. In 2015, she won the César Award for Best Actress for performance in the film Love at First Fight. Since 2014, Haenel has been in a romantic relationship with director Céline Sciamma, whom she met on the set of Water Lilies. Haenel publicly acknowledged their relationship in her acceptance speech for her César award in 2014. Their relationship continues. ^ "France's Cesar Awards: Me, Myself and Mum Wins Best Film". Hollywood Reporter. Retrieved 3 May 2014. ^ "Cesar Awards: 'Timbktu' Sweeps, Kristen Stewart Makes History". The Hollywood Reporter. ^ Romney, Jonathan (4 December 2016). "Adele Haenel, Recycling cliches is a sign that a film lacks courage". The Guardian. Retrieved 8 December 2016. ^ "Une Bien Belle Vie de Courgette". L'Avenir. 2 October 2016. Retrieved 26 February 2017. ^ "Famous Lesbian Couples Whose Relationships We Applaud". PagalParrot. 2017-02-09. Retrieved 2017-06-26. 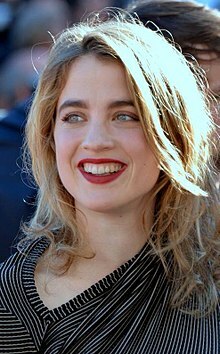 Wikimedia Commons has media related to Adèle Haenel. This article about a French film and television actor or actress is a stub. You can help Wikipedia by expanding it.